Market State 11 – Confirmed Bear/Short-Term Bullish: The current advance is now about four weeks old and is up 10.6% from the February 11th low. This sharp advance is more than enough to upgrade the Market State rating from Market State 12 to Market State 11 – an improvement from the worst (MS 12) to the second-worst (MS 11) short-term market environment. On the other hand, bear market rallies are known for their short-term strength, which can create an overbought (bearish) condition (up too far, too fast). The overbought (bearish) condition overrides any short-term bullish indicators during confirmed bear markets. Overbought/Oversold Indicator (95% overbought - Short Term: Bearish): A reading of 95 or higher, either overbought or oversold, is considered to be an “extreme” level. 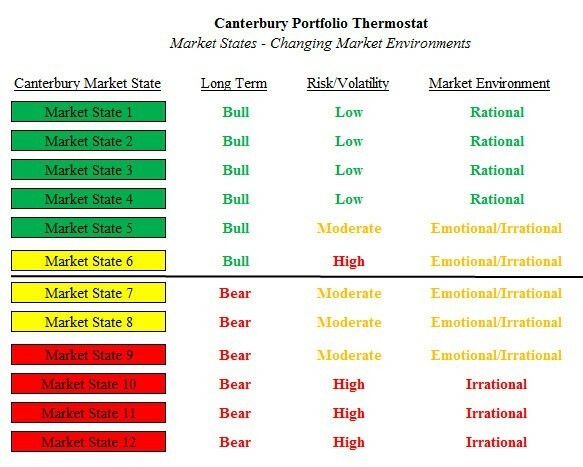 The Portfolio Thermostat has been in one of the Transitional/Bearish Market States, now confirmed “Bear” Market State, for the last 140 trading days. Canterbury Volatility Index (CVI 93 - Bearish): The current high volatility is reflective of a high correlation among the S&P 500 stocks, resulting in a loss in the benefit of diversification. The Dow was up 1.2% for the week, while the S&P 500 finished up 1.1%. Most major market indexes were slightly down or flat through Thursday but the week was rescued by a big day on Friday (the S&P 500 was up +1.67%). The issue with Friday is that it was, what I call, a 1 day outlier. Such a day would be rare if we were in a bullish Market State, which we are not, but big outlier days, up or down, are common and expected during bear Market States. In market environments with high volatility, a large percentage gain over a few weeks (such as the current four-week advance of 10.6%) and one-day outliers of 1.25% or 1.5% or greater are all signs of an erratic and inefficient market environment. These characteristics are textbook examples of what to expect during a bear market. Compare the most recent 140 days that have been in a Bear Market State to the previous 140 days in a Bull Market State. The current rally has been led by industries and stocks that have been among the most beaten-down. Last week’s update had some examples of securities that had declined way below their 200-day moving averages. It is normal to have stocks that have been slammed down with high volatility to have equally sharp countertrend rallies, followed by a retest of their old lows. Financials is the only sector that continues to lag behind the other underperformers. It could potentially catch up. Risk management is most important during bear markets. Bear markets will have big moves, both up and down, and rallies during these periods are much easier to identify after the fact. Recall the -5.7% decline that occurred over the 9 days prior to when the current rally started. Both the decline and advance are reflective of bear market behavior. The Portfolio Thermostat continues to meet its bear market objectives of holding one-day declines to 1%, with a few 1.25% outliers. Any total peak-to-trough declines should be held to the level of “normal market noise” – at about 8% to 12%. The Portfolio Thermostat is about producing compounded returns and maintaining consistent volatility through variable market environments.